Switching over to an energy-efficient lighting system might seem like a daunting task, but it doesn’t have to be as complicated as most people believe. LED technology is one of the most promising and widely-used energy-efficient lighting options, but once you decide on LED lighting, you probably will have a few questions about the process. Your first question might be whether or not you’ll have to replace all the existing lighting fixtures in your home in order to take advantage of LED energy-efficient lighting. There are two options for those who want to upgrade their home with LED lighting. The first is to use retrofitting systems to avoid having to replace the fixtures, and the second is replacing the fixtures with LED-specific fixtures. In essence, retrofitting means that you make the existing fixtures work by shaping the LED bulbs to those systems. For example, an LED bulb that screws into a standard lightbulb socket is a retrofitted bulb with an included LED module. The LED module allows the older socket to work with the newer LED bulb. 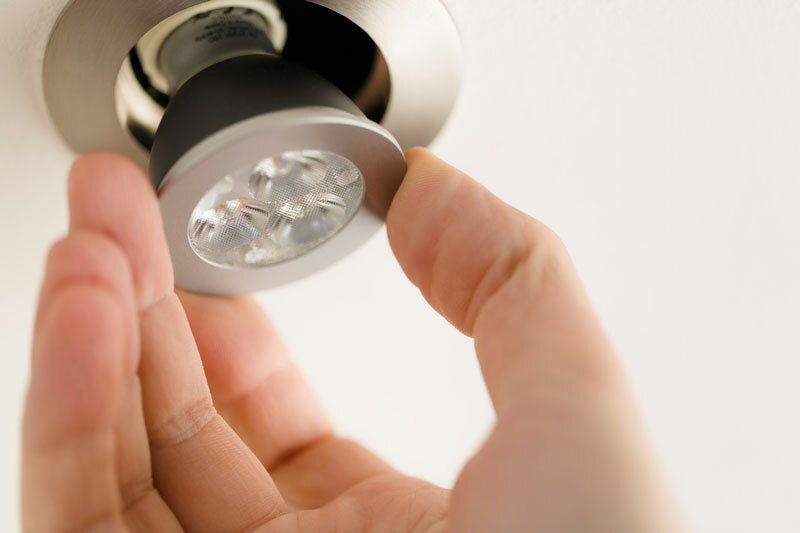 In some cases, you can find LED bulbs with separate LED modules that must first be installed in the older socket. Retrofitting is an excellent idea for those who want the smoothest transition to an energy-efficient lighting system. Many power companies offer rebates or even free LED bulb packages for customers who wish to make the switch, and the bulbs will drastically lower your lighting power costs. In many cases, LED lighting offers a smoother, brighter light that more adequately illuminates a scene, which is especially helpful if you have a commercial business that uses a video surveillance system. There are a few situations in which an LED light fixture would be a better option than retrofitting. For instance, if you are developing a new construction project that has no existing fixtures, it would make more sense to install dedicated LED light fixtures instead of using cheaper standard lighting fixtures that would then have to be retrofitted later. Some other things to consider when it comes to the differences in these two systems is the ease of replacement. When an LED fixture goes out, you’ll most likely have to replace the entire fixture, but when a retrofitted LED bulb goes out, you only have to exchange it for a new one. Retrofitting tends to be a bit more affordable than brand new LED fixtures as well. If you need expanded functionality in your lights, like the ability to dim the lights or have them change color, LED fixtures might be the way to go since retrofitted LED lights tend to be less complex and therefore less feature-rich. Whether you would benefit from retrofitting your existing lights or installing brand new LED fixtures is really based on your specific situation. For a more in-depth consultation and professional advice, call the experts at AJ’s Electrical at (604) 359-1916.